One of the ways our center serves our clients is by partnering with families in the process of reunifying with their children and the Practical Fatherhood curriculum as been a great asset! The Fathers who have participated in these lesson have enjoyed the videos. The lessons are easy to understand and are applicable to their current life situation. The Dads like that it is information they can take home and put into practice. Fathers are an important aspect of family life and we are thankful Earn While You Learn offers lessons to strengthen and educate fathers! We have had several father's start and go through these classes. This information seems to be very helpful to them. The only concern/thought I have is that sometimes there is a home without a father or without a mother. It would be helpful to discuss what these families look like and what the family roles change to. Unfortunately, the father is not always the head of the household and it would be helpful to have engagement of what it looks like for the mother to be the head of the household and how to fill that role and vise versa. Our clients have expressed that they like the straightforward information presented in the Practical Fatherhood curriculum. The lessons are short, so it is easier to focus for the entire time, and has great opportunities to pause for discussion or questions to revisit during a discussion time after the lesson. Practical Fatherhood has been a wonderful addition to our Earn While You Learn program. We had one client who did not have a father figure in his home growing up. These lessons helped prepare him to be the father he never had. We have done it one-on-one. However, I personally feel it is more designed for a group and that the men would get more out of it if they could hear other fathers viewpoints during the discussion lessons. The Pregnancy Resource Center of Owasso have been ministering to young women for over 27 years. Four years ago, we began a separate program for the Dads. 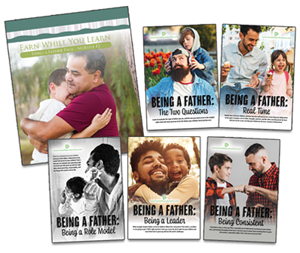 The practical fatherhood series is the cornerstone of our ‘Dad Men Program’, providing our male mentors the tools that will help show and motivate our new dad’s to become good fathers. A quote from one of our male mentors: “Two of my favorite lessons to start dads out with when they begin our program are, (Role Models, and Real Time) “. Showing our new dads that the most important resource a new father can provide their child is ‘Time’. Practical Fatherhood has been an instrumental tool in helping open up the dialog between our Dad's mentors and fathers. We are pleased with the topics and the doors to discussion that it has opened up to us with our clients. Our center has been using Practical Fatherhood for several years with great results. The young men relate to the lessons and talk about how much they learned from them. It really helps them understand their role as fathers and encourages them in a healthy way to step up and be better parents and role models. We love these lessons! Short, to the point, and covers all of the important topics...we think it holds our fathers' attention well while giving them a great overview of fatherhood. The program has allowed a father to Express their concerns and fears. One father stated he feels ready to be a dad after sitting through the program. It's simple and easy to follow and use with several men or individually. Practical Fatherhood is great as reported by fathers taking the classes by also by the wives who report and are excited that she "has benefitted from more support. It was both a "call to arms" in a sense of duty and a "wake up call" in the realization that he maybe being selfish in his personal time and priorities. Thank you for helping repair some marital disfunction we were suffering." We have many fathers taking classes with us and this is a great resource for them. Very informative and practical. Thank you! We ordered this at the last Care Net Conference. It has been a huge success with our dad's. All have said what great information it provides, and gives them a sense of importance also! We were excited to add this to our existing curriculum because we see about 6-8 single dads a week. The only thing we were surprised to find is that the DVDs only cover two of the 10 lessons; the remaining 8 are discussions and pretty lengthy. The information is really good, though. The Practical Fatherhood program has been worth its weight in gold! The men who have availed themselves of the lessons have grown to accept the role of father as one that is critical to the welfare of their child. So many of the men we have seen are themselves the product of an absent father as they grew up and, therefore, have nothing to compare to when it comes to what exactly a father is supposed to do and be. Many thanks for this piece of literature / material to aid our efforts in meeting the needs of the whole family. Dads are so important! And that is why we wanted to have a curriculum specifically for our dads who visit our center. These lessons offer helpful advice along with DVDs that show modern dads facing every day challenges. We give it a thumbs up! Our Dad's Mentors really love the Practical Fatherhood Module. It has wonderful information that Dads can use the rest of their lives. Practical Fatherhood is a great addition to the Earn While You Learn program. Many of the young men we see are court ordered to take parenting classes for many different reasons. Most males come to our centers because they have to, but continue coming even after they have fulfilled their obligations to the courts because they enjoy the Practical Fatherhood classes. We are loving this curriculum for our male clients who come in. It is practical and easy to use. The fathers are seeing their role and the importance of being a part of their children's lives and the rewards of being there and being a good role model. Thank you so much for having this and making it available for us here at the Crisis Pregnancy Center of Greater Phoenix Inc. The Practical Fatherhood curriculum was a perfect addition to complete our curriculum, designed specifically for our dad's! It has helped our fathers become a better role model for their children makes a huge difference in their children's life! This program is helpful in informing fathers of their important role in parenting. It is a great and successful tool for showing fathers that they can be leaders and don't have to take a backseat to raising their children. Men need to be courageous and fight for what is right in our days ahead and this program gives them that extra arrow in their quiver. Our client consultants like the simple but impactful information that each lesson provides. They also feel that the lessons keep our clients attention and offer a wide range of topics. Our goal is once a father completes Practical Fatherhood we would then introduce him to the Men's Fraternity pack for more in depth lessons.